DENVER, CO––1:00pm MST: Activists are currently flying a massive 25’ inflatable “blimp” above Summit Music Hall, 1902 Blake St, in Denver, CO where a broad coalition of musicians, celebrities, and organizations opposing the Trans-Pacific Partnership (TPP) are hosting the kick-off of the Rock Against the TPP tour tonight. 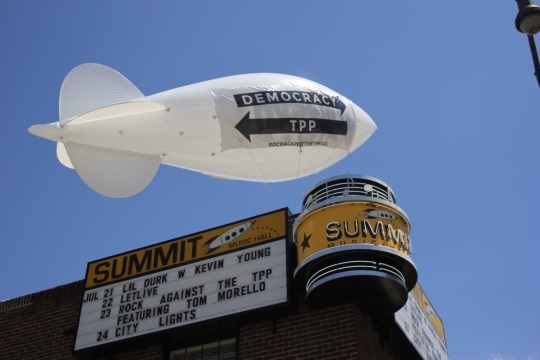 The blimp, which can be seen from quite a distance, features a message about how the TPP is the antithesis of democracy. The raising of the blimp comes just hours before legendary guitarist Tom Morello (Prophets of Rage, Rage Against the Machine, Audioslave), popular punk band Anti-Flag, Golden Globe nominated actress Evangeline Lilly (Lost, The Hobbit, Ant-Man), Denver-based hip-hop outfit Flobots, and buzzworthy bi-lingual rockers Downtown Boys will appear at a free concert in Denver at Summit Music Hall to mobilize opposition to the TPP agreement. The event will kick off the Rock Against the TPP roadshow, a nationwide series of activism-fueled music events designed to raise awareness about the dangers of the toxic deal, which was negotiated in secret with hundreds of corporate advisors. Organized by Morello’s new label, Firebrand Records and digital rights group Fight for the Future, other stops on the tour feature well-known performers like Talib Kweli and Jolie Holland. The TPP has little to do with trade, but would provide multinational corporations with new rights and powers that threaten good paying jobs, Internet freedom, the environment, access to medicine, and food safety. The events in Denver begin at 5:00pm with a rally and press conference outside Summit Music Hall, MC’d by Jonny 5 & Brer Rabbit of the Flobots. Tom Morello, Evangeline Lilly, and organizers of the event will provide statements to the press. The concert then begins at 6:00pm. In addition to the performances, the Denver concert will feature speakers from a wide range of organizations opposing the TPP including Lori Wallach, Director of Public Citizen’s Global Trade Watch, as well as speakers from Food and Water Watch, Padres y Jovenes Unidos, the Sierra Club, the Association of Flight Attendants, Conservation Colorado, Rocky Mountain Farmers Union, Standing Up for Racial Justice, United Steelworkers, Denver-based technology startup SecureSet, Communications Workers of America, Student Labor Action Project, and more.